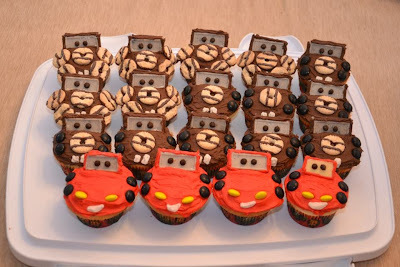 Bonnie Banters: Lightning McQueen and Tow Mater Cupcakes with Favors For A Car-Themed Birthday Party! Lightning McQueen and Tow Mater Cupcakes with Favors For A Car-Themed Birthday Party! I just recently returned from my son's out-of-state wedding; and even though I'm still aswoon from their unique and unbelievable event, I'm trying to catch up on everything. 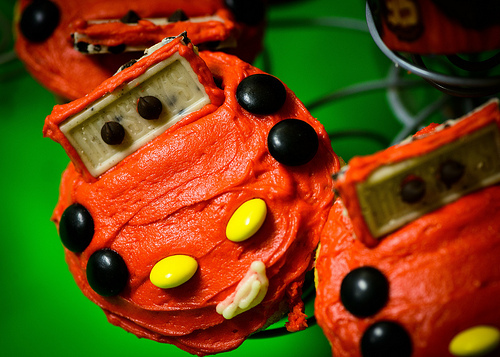 Therefore, I'm sharing some creative treats, which I've been holding in reserve, from the car-themed birthday party my daughter threw not long ago for my grandson's fourth birthday. I thought you would enjoy my daughter's clever creations, which were inspired by the internet, especially if you have a car-loving child (like my grandson) with an up-coming birthday. Vanilla or chocolate butter cream frosting recipe(s) from my Very Happy Birthday Pound Cake with Rich Chocolate Frosting. Food coloring for the red frosting and black eyes. Bite-size cookies and candies per the photos. Fill lined, standard-size cupcake pans approximately 2/3 full and bake at 350º for about 20 minutes, or until a toothpick inserted in the middle of a couple of cupcakes comes out clean and the cupcakes spring back when lightly touched with the finger. Cool completely. Frost and decorate the cupcakes per the photos. 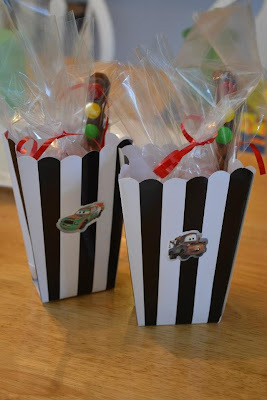 See this reference for decorating; however, it would be easier to use rectangular, bite-size candy for the windshields (like pieces from the Hershey's Cookies 'n' Creme Candy bar) and glue, with frosting, mini-chocolate chips for the eyes, or just pipe on the eyes. 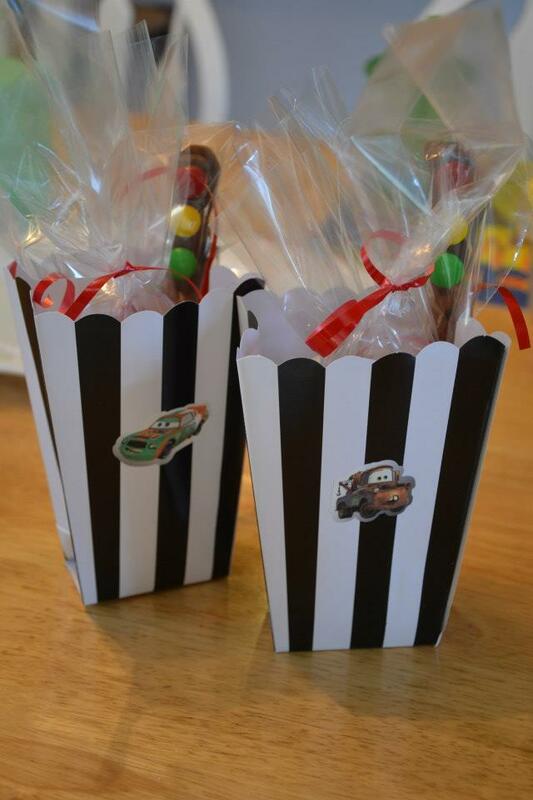 The favor bags my daughter created included pretzel sticks, which she made to look like stop signs. 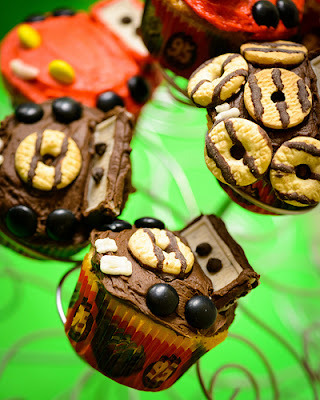 The pretzels were dipped in chocolate and decorated with bite-size candies. The favors also included mini-chocolate donuts, which she made for spare tires, and chocolate-dipped potato chips, which she made for flat tires! Everything was individually packaged in cello bags inside the favor bags, which were decorated with car stickers. 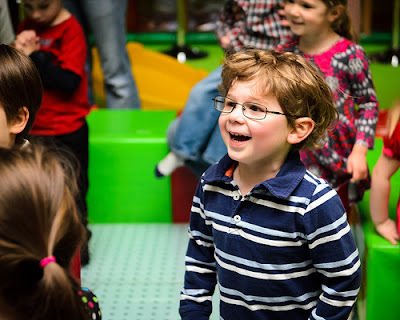 My grandson clearly shows his excitement to see Buzz Light Year at his birthday party, which was held at an indoor play center. Needless to say, the party was a big hit! Have fun making these cupcakes and favors and enjoy the thrilled expressions of the little race fans when they feast their eyes on them! Congratulations on your son's nuptials! Your daughter possesses some seriously, amazing skills! I love the Lightning McQueen cake, and in fact, was asked to make one years ago..thankfully they cancelled because I don't think mine would have looked anything like a car lol. That said, your grandson is a cutie pie! Your daughter has inherited your talents in the kitchen! What adorable cupcakes...and your grandson looks beyond thrilled! Congrats to your son (and your whole family!). question for you. are those black or brown m&m's. i think these are adorable and want to make them for my sons birthday this month. Black..thanks for asking and hope you have as much fun making as my daughter did!